He has written and produced comedy/talk shows for over fifteen years. 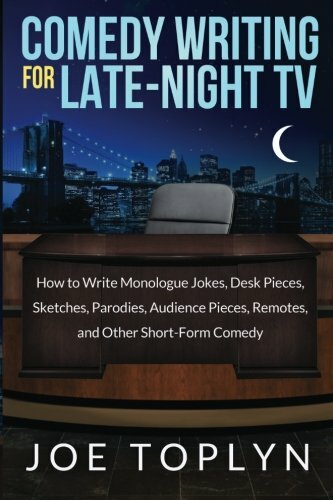 Now four-time Emmy winner Joe Toplyn reveals his proven methods of writing for late-night television in this one-of-a-kind insider’s guide. Toplyn analyzes each type of comedy piece in the late-night TV playbook and takes you step-by-step through the process of writing it. His detailed tips, techniques, and rules include: • 6 characteristics every good monologue joke topic must have • 6 specific ways to generate punch lines • 12 tools for making your jokes their funniest • 7 types of desk pieces and how to create them • 9 steps to writing parodies and other sketches • How to go after a writing job in late night • PLUS a complete sample comedy/talk show submission packet Also use this comprehensive manual to write short-form comedy for the Internet, sketch shows, magazines, reality shows, radio, advertising, and any other medium. More than Just Late Night Comedy Writing!